A look at those bizarre, vaguely horse-themed gifts horse lovers receive from well intentioned non-equestrian relatives. 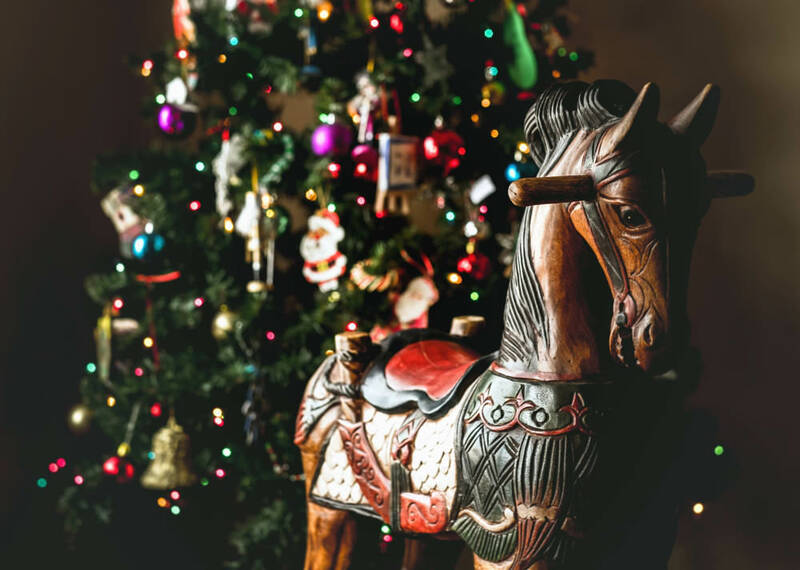 The holiday season is here, and that means that across the country, relatives of horse lovers just like you are buying some really strange horse-themed items to put under the tree. When it comes to gifts, it’s the thought that counts, but sometimes you have to wonder what your distant relative, non-equestrian friend, or the coworker who drew your name for Secret Santa was thinking when they exchanged actual currency for some tacky equine trinket. Nearly every horse person has been through the awkward experience of unveiling a well-intentioned gift from a non-horsey giver. “Wow … thanks, Uncle Jim!” you say after opening the free-standing toilet paper holder in the shape of an anthropomorphized horse that apparently made him think of you. It’s not that you’re ungrateful. It’s just that you know he spent time, money, and wrapping paper on something that is destined to take an immediate trip to Goodwill. Put a Horse on It! You can find any product with a horse on it, but that equine flair doesn’t necessarily make it the best choice. A scratchy blanket or a bag that falls apart after a single use aren’t much good, even if they do have a horse on them. You’ve spent years honing your eye for good conformation and correct horsemanship. Your relatives have not. From your Aunt Mildred’s perspective, the framed horse picture she found for you at the church bazaar was the perfect gift. But to you, it’s a horrifying image of a neglected horse wearing tack that was pieced together from junkyard refuse. Then there’s the gift shop figurine that your coworker thought would look great in your cubicle, but it has such contorted conformation that it actually hurts to look at it. Sometimes you just have to wonder about the inventor of a particular item. Did they really think the people were clamoring for a clock that emits a high-pitched whinny every hour? Who is the person who wears the horse’s-rear-end necklace charm? How do these things make it to market—or your stocking? And I’m not talking about the whinnying clock you smashed on hour three. This is based on the old adage that even a broken clock is right twice a day. Similarly, every once in a while the roulette of inappropriate horse gifts brings you something good. One Christmas, my grandma gave me a kitchen towel with a horse on it. I wouldn’t have bought it for myself, but you know what? I did need a kitchen towel, and the design was tasteful enough that it didn’t make my kitchen look like it was decorated by an 8-year-old. Sometimes grandmas just know. There are ways to avoid the awkwardness. You can send a list of links to the exact products you have on your wishlist with sizes and colors specified. Or you can ask all of your relatives to take what they would have spent on your gift and donate it to your favorite local horse rescue or therapeutic riding center. But there are always going to be those people who are absolutely convinced they’ve found the ideal gift for you at some highway truck stop store. All you can do is smile, graciously thank them, and save it for your next white elephant party.